About four months ago, Kanye West randomly announced that he will be dropping an album this winter titled 808’s & Heartbreak. While the announcement caught everyone off guard, the details were even more startling. The album was to said have little to no rapping, and be complete autotune. 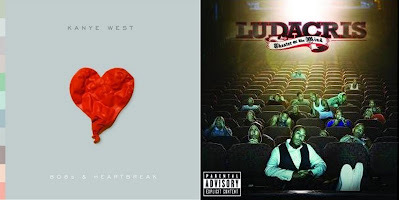 As soon as the buzz started to pop off from “Love Lockdown” and “Heartless”, the release date was moved up to November 25th; the same day as Ludacris’ Theater of the Mind album. Eventually both albums got the green light for a November 24th release, but the question was, will Kanye’s experimental album flop and how will it effect Ludacris’ sales? If you’ve been tuned in to Hip Hop AD (props if you have), you’ve seen the poll asking readers which album were they going to buy the first week. Click the full story to check the poll results and the actual album sales! The sales are in for the week of 11/24. Kanye tops the charts selling 451,935 and Ludacris debuts at number 5 moving 214,126 units. 808’s & Heartbreak will definitely strike gold next week, and I can see it going platinum over time. As for Ludacris, he will definitely make it past gold status. Regardless of the sales, both albums were great. Make sure you go out and support these artists.